Intuit’s QuickBooks will soon offer enhanced payroll services including direct deposit for contractors and same-day payroll deposits for employees. The additions, Intuit said, are designed to help small businesses cope with their workers’ demands for fast and flexible payment options, which are gaining importance in a continually tight labor market that relies on a growing contingent workforce. And, we should note, few would argue with the company’s point that paying workers is one of small business’s biggest pain points. It’s important for HCM technology companies to keep an eye on Intuit because of its deep penetration of the SMB market—the same market that’s looking more and more for technical solutions to HR challenges. According to numerous reports, QuickBooks holds 80 percent of the market for small business accounting software. But as important, at least in the long term, is the company’s open platform, which has resulted in the development of some 1,400 third-party apps. Not surprisingly, many of these of related to finance and payroll issues such as time-tracking, mileage tracking and tax planning. But there are also solutions for scheduling, CRM and—wait for it—HR. Through QuickBooks, users can access workforce management systems like EmployeeConnect, performance reviews by JuvodHR, organization charts by PeopleGrid and benefits management by Humanefits. 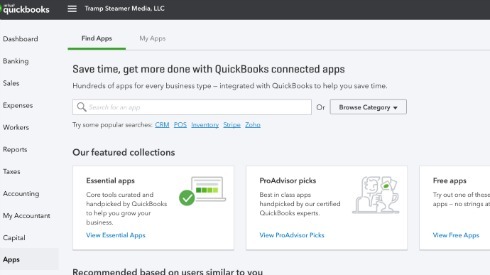 By our count 29 products are listed in the Human Resources section of the QuickBooks app store, and some of them offer services for organizations with up to 300 employees. Given the growth of the contingent workforce—Intuit estimates 43 percent of the American workforce will be self-employed by 2020—it makes sense that one QuickBooks’ new features, Contractor Direct Deposit, enabled businesses to pay contractors via direct deposit and become a handy companion to services that help prepare 1099s and keep records. The second enhancement, Same Day Direct Deposit, QuickBooks Payroll customers will be able to approve direct deposits up to 7 a.m. (PT) on the payday itself. Intuit claims that since it introduced its 24-Hour Direct Deposit service last year, QuickBooks Payroll users have been able to significantly improve their cash flow. The same-day service, which is free to QuickBooks Full Service Payroll users, seeks to go a step further. Neither of these are particularly dramatic steps, but they’re certainly enough to get the attention of small and microbusiness owners. The tradeoff customers have always had to make when choosing QuickBooks Payroll over, say, Ceridian, has always been about the amount of effort they had to put it: QuickBooks was cheaper but required more effort on the user’s part. But now here are two more steps to remove some of that extra effort. But the like of ADP, Paychex and Ceridian aren’t the only ones contending with Intuit for SMB dollars. As we’ve reported before, a number of vendors are looking toward smaller businesses for growth. These include Willis Towers Watson with its HR Trove and San Leandro, Calif-based TriNet, which targets organizations with between 10 and 500 employees with the aim of growing with them over time. Intuit has never swayed from positioning QuickBooks as financial product. But since the one thing even the most HR-adverse small business owner can’t duck is payroll, the product’s a perfect Trojan Horse for an advance into the HCM tech market.